If you follow me on Instagram or Twitter, you might’ve already noticed that I very recently went to Japan for two weeks. I’m still a little jet lagged and I’m definitely missing the traveling excitement, but it’s also good to be back home. Make-up fiends will know that Japan is basically heaven when it comes to make-up brushes, so I knew beforehand that it would take a lot of restraint not to spend an insane amount on them. I do own quite a lot of brushes as it is and to be completely honest.. I don’t need any new ones. Brushes are definitely my weak spot in make-up, there’s just something about finding a new brush that does an amazing job. I ended up allowing myself to get one brush per brand - which resulted in four brushes in total. The Japanese brands Hakuhodo, Rokkakukan-Sakurado, Koyudo and Chikuhodo became the final winners. From Koyudo I bought a very pretty flower brush. 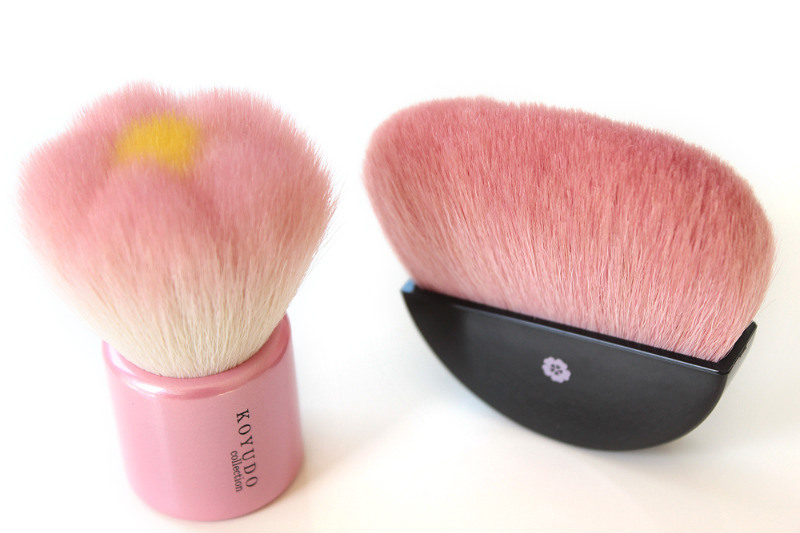 I had read about these flower shaped powder brushes before & quickly decided I wanted to get one of these novelty brushes. There are also heart shaped ones available, but the Sakura version stole my heart. The little shop I bought this one at sadly had no-one speaking English, and since I don’t speak any Japanese either.. I picked this one and headed for the till. I just now found out that I actually bought a face-wash brush instead of a powder brush, but since both are made from the same mix of bristles I figured I’ll still use this one for powder touch-ups. It’s very soft, but not too dense. I think it’ll be accompanying me in my handbag from now on! Rokkakukan-Sakurado is a lesser known brand from Kyoto, although they have quite an extensive collection of handmade brushes as well. 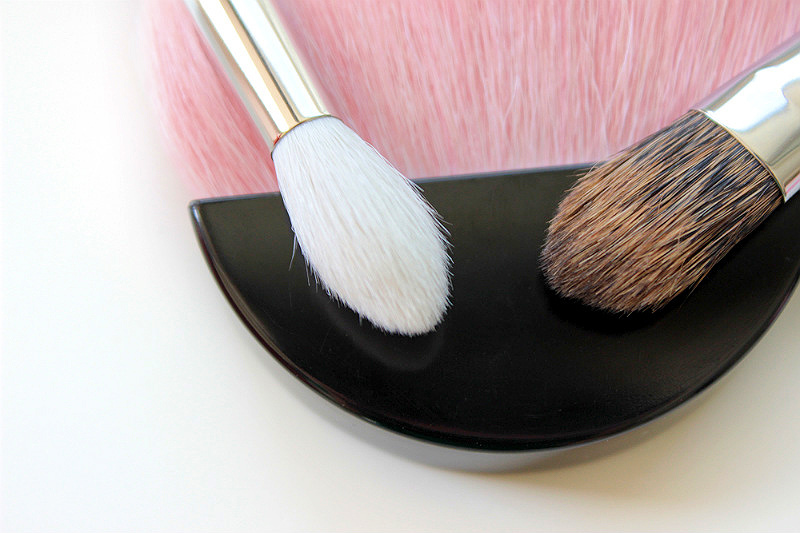 I’ve been wanting to purchase one of these fan brushes because these make for some super-easy shaping on the cheekbones. 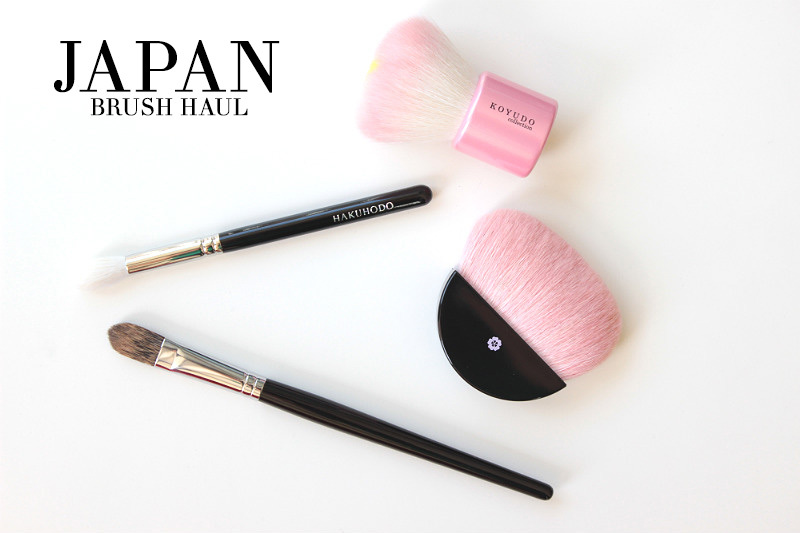 I believe this one is called their Beppin Sakura Powder Brush, although I am not sure since I am Google translating whatever I can find on the brand. The bristles on this one have been placed in a curve so there’s no flat part, which ensures powder to be applied evenly. This one has a very pretty gradual pink dye which turns darker or lighter as you turn it around - and it’s super soft too. As far as I know this brand is only sold in Kyoto, since it’s a true Kyoto brand. I’m very happy that I found out about them! Next time I visit Kyoto I’m definitely heading back for more. From Hakuhodo I got an eyeshadow brush from their J-series, the J5522. This one again is just so so so soft. It’s the kind of softness you don’t experience often with brushes from the bigger brands you can get in Europe or the US. It’s quite the big brush, but thanks to its tapered end this one is perfect for applying & blending out the crease shade. I am still trying to figure out how on earth this brush retails for only about €13.00 (I paid a little under 2000 Yen), it is the most amazing value for money. If you do visit Japan and you want to see their whole range, I strongly advise you to visit their flagship store in Omotesando in Tokyo (view a plan here). The shop is located on the third floor which can seem a little crazy for Europeans who are used to finding shops on ground level - but just go ahead and take the elevator. 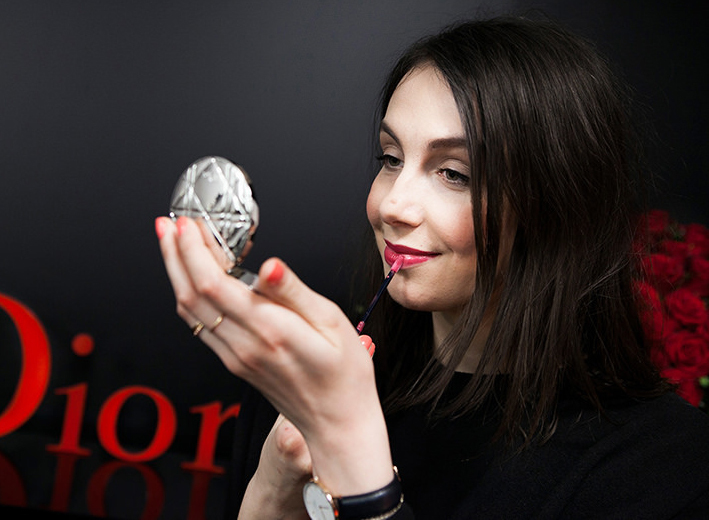 The girls working there are very friendly and knowledgeable and the whole process of buying brushes there is a dream! Also, the shop is located in the very lovely Omotesando area with cute boutiques and brand shops, so you won’t regret the visit. Finally I also got a brush from Chikuhodo in a small shop, which meant I only had access to their wholesale series. Chikuhodo is very open about manufacturing brushes for brands like Shiseido and Suqqu and have quite a few brush ranged carrying their own name as well. I hadn’t done enough research on where to find which Chikuhodo range before leaving, so I was happy to find the Y-series (their most expensive range available through wholesale) and to experience how well these were made too. I got the Y-3 brush, which is a large eyeshadow brush. This one is a natural bristled brush, just like the above three ones are as well. I bought this one specifically to apply setting powder under the eyes, but this would also be perfect for applying a base eyeshadow colour. I really loved browsing all the brushes in Japan - there were just so many and they all looked so luxurious and tempting. The idea of opening a shop with only makeup brushes almost seems crazy here in Europe, but in Japan this craftsmanship is quite common and everyone seems used to high quality brushes. Even the drugstore brushes seemed very qualitative! I did buy more than just these four brushes.. 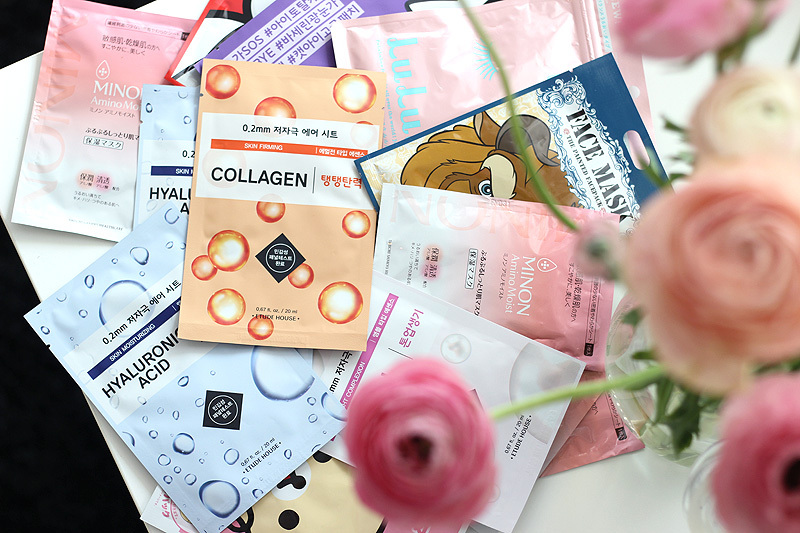 So stay tuned for a big haul with all the other cosmetic/beauty related things I got in Japan. I’ll also be posting some more about Japan, including posts about how to prepare when you’re visiting Japan, what cool spots to certainly visit and what to expect there. I had an amazing time and I can’t wait to share more experiences with you!